In this map you will not find countries, states, nor cities. You will not see clean, straight lines nor finite divisions between labels. What you will find however, is unadulterated, diverse representation of cultures far too often forgotten about or erased from the public eye. This is Native Land, an interactive, open source map made to put indigenous people back on the map (literally). Perhaps what is so extraordinary about it is that the viewer doesn’t even need to click on any territories to be impacted. From the first moment it is seen, it reveals an unyielding complexity of boundaries, and creates a sense of wonder just from the sheer number of native cultures that have and continue to exist. It is ambidextrous, creating a gut reaction that evokes an immediate curiosity that draws people in whether a geography nerd or not. When the viewer clicks on a territory, they are given the name of the people of that land, and directed to a secondary source that provides them with websites and related maps regarding the culture. It is simple, yet extremely all-encompassing. The map also can be switched to languages spoken, and treaties formed. It is humbly created, and welcomes open source information that can constantly be added to enrich and extend its representation. Perhaps what is most compelling about this comprehensive map is that it tells the truth. It turns people on their heads, combining familiar continental shapes with territories that overlap, break, and extend freely into ocean. This simple fact of including all of these territories on one map atop one another might seem messy or overwhelming at first glance, but it is in fact the whole point of it. One look and the viewer is engaged and educated of the fragility and adaptation of boundaries; how they are not finite as one might think. What is truly special about this map is that it illustrates not only where Native American lands are in North America, framing a narrative that is often overlooked, but also includes other indigenous boundaries on a global scale: including cultures in Oceania and South America. 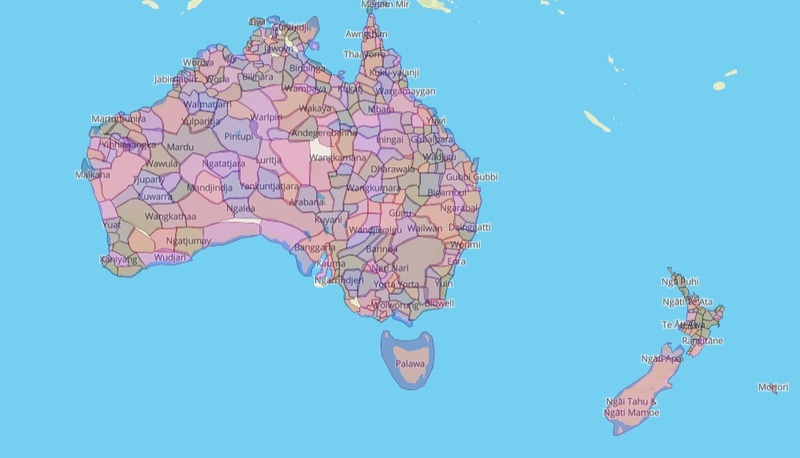 For centuries indigenous people have been left off maps, but on this one, it is everyone else who is left out. While some might look at this map and recognize its importance as a historical tool- a look into what was just a few hundred years ago- this map is also alive in many ways, showing not just what was, but what is. In an age where indigenous peoples are often erased from our view, native land lets them be shown. A special thanks to our sponsor Mapbox, for allowing this map to exist online and in an open source format.